Home » Change the Shape of Your Nose Before the Holidays! Change the Shape of Your Nose Before the Holidays – Now with Complimentary Consultations! 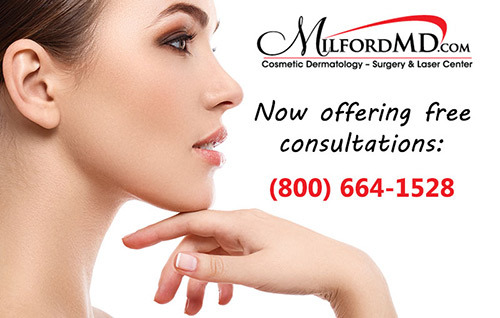 MilfordMD is now offering free cosmetic consultations in the month of December for last minute treatments before the holidays. Most people are familiar with rhinoplasty, a surgical nose reshaping procedure that can permanently and dramatically alter the shape of one’s nose. What many don’t know is that going through surgery and the weeks or months of recovery from rhinoplasty may not be necessary. In fact, there is a nonsurgical option to nose reshaping that involves the use of specific fillers. For those who want to modify their nose before the holidays, traditional rhinoplasty surgery isn’t an option. But nonsurgical rhinoplasty is and we perform it at MilfordMD as a lunchtime procedure. Dr. Buckley says that physicians experienced in the use of cosmetic fillers can artistically and subtly camouflage small nose shape deformities, such as a slight hump on the bridge; change or slightly lift the nasal tip; fill depressions; even, make a curved nose appear straighter. Fillers can’t reduce the size of the nose. The cosmetic surgeon says he uses specific fillers to accomplish the task. “Hyaluronic acid fillers, including Restylane, Juvéderm or the calcium hydroxyapatite filler Radiesse work well in nose reshaping,” he says. Nonsurgical nose reshaping isn’t new. Surgeons attempted to use fillers, including silicone, which is permanent, at the turn of the 19th century to correct nose deformities. But those early attempts often were not successful because the fillers they used, such as liquid paraffin, were harmful. Refinements the procedure and the availability of many new filler types in recent decades have made the procedure a successful and popular option. A prominent facial feature, changes to the nose—no matter how subtle—can have dramatic effects on the overall facial appearance, according to the cosmetic surgeon. “While there are potential complications with even nonsurgical procedures, those complications tend to be far less than with surgery. Nonsurgical nose reshaping is safe and effective for temporary modifications to the nose,” Dr. Buckley says. “With the holidays right around the corner, patients can come in with their old noses and leave minutes later with their new noses. There is usually no swelling or bruising, and if there is, it subsidies usually in about 48 hours.